Genuine Military Naval winter uniform Russian fur hat - sheepskin Ushanka. Made of natural highest quality mouton sheepskin and natural leather. (some other stores offer same style hats made of artificial materials instead. Don't expect a good quality for a $25 or less.) Thick and soft fur gives warmth and comfort and also impact protection - can be a good ski hat / helmet (especially, this type with leather top, which makes it 100% waterproof). This hat was worn by Sean Connery in the "The Hunt for Red October" movie. 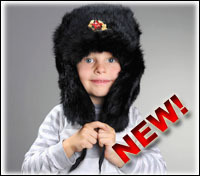 An ushanka hat is a traditional Russian headwear, which is yet very trendy and stylish. It is extremely warm as it was designed for severe Russian winters. Its secret is in ear-flaps, that can be tied in three different positions to keep you warm and cozy. This is due to these ear-flaps ushanka has its name, as “ushi” in Russian language means “ears”. Wearing ushanka with ear-flaps tied under chin will protect your ears and chicks from cold, and if tied on the heads back, it will effectively protect your neck from wind. As you see it is very practical, and moreover these positions give you three different styles of a hat. Ushanka is a universal headwear. Is it appropriate for any situation. It looks good as a formal wear and for sure it is very stylish even when you are on a snowboard or skiing! Of course it is a great mens gift idea for Holiday / Christmas present!